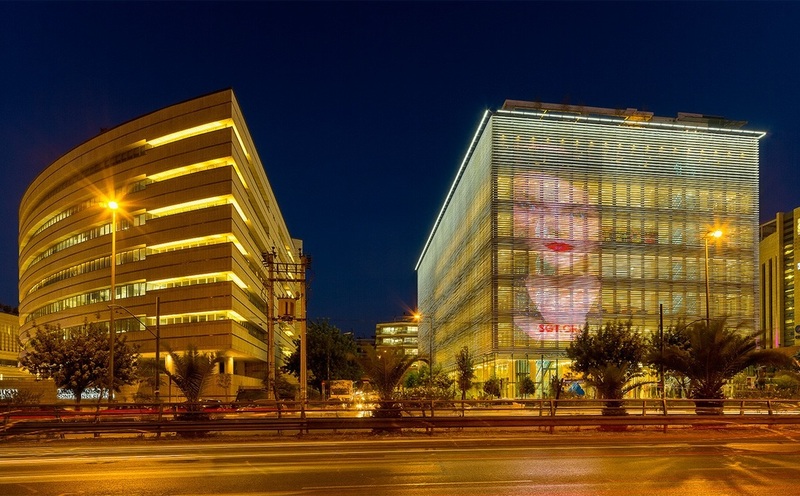 The Onassis Cultural Centre, Athens. 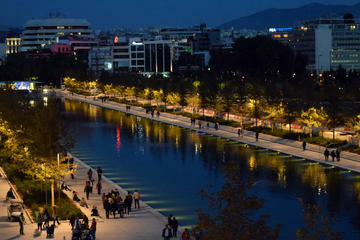 The foundations of the Onassis Cultural Center, exclusively funded and overseen by the Onassis Foundation, were laid in Athens in 2004. The Center was built on a 3,000 sq. m. plot on Syngrou Avenue and covers an entire city block. The Center boasts 18,000 sq. m. of interior space. 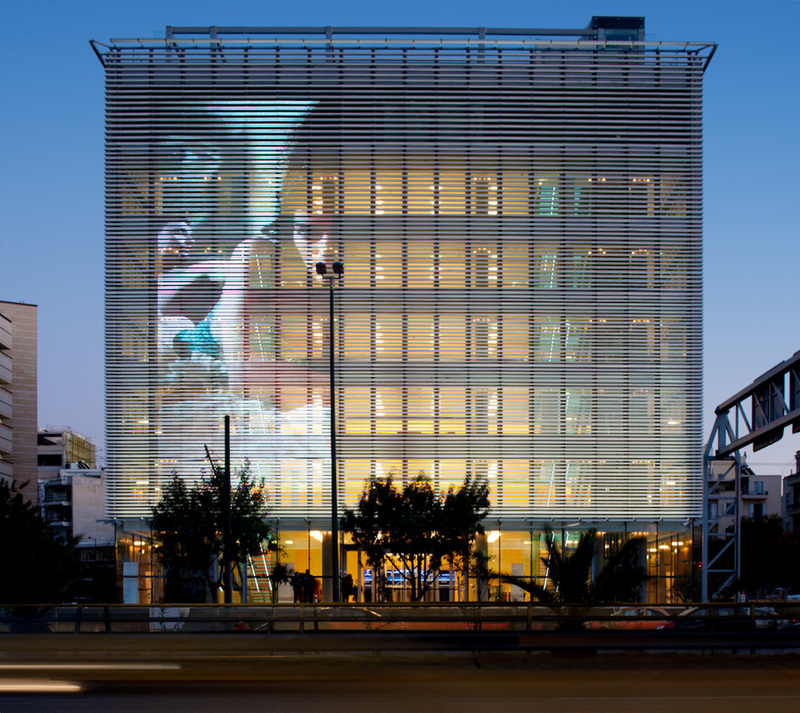 The Onassis Foundation staged an international architecture competition and the design chosen among the 66 proposals entered from around the world was by the French architectural firm “Architecture Studio”, whose core architectural concept is encapsulated in the building’s facade: an airy white rectangular shell which makes innovative use of white marble bands. The unique configuration of the facade serves as a stage set which imbues the building with a sense of mystery both during the day, when the marble bands serve to reflect the intense light of Attica and create the impression from afar of a gentle wave, and at night when, artificially lit, they turn the image inside out by allowing the inside of the building to shine through and revealing the warm shell surrounding the rooms and auditoriums. ​A new architectural study was drawn up for the interior of the two amphitheaters, while the ground-floor bar was redesigned by artist Aemilia Papafilippou around an original artwork. The theater lighting in both auditoriums was designed by James Morse from the London-based Light & Design Associates company, while the architectural lighting for the entire building was redesigned by Eleftheria Deko & Associates. The building includes two main auditoriums, seating 880 and 220 respectively, which are suited to a wide range of events including theater and dance performances, concerts, film screenings (multimedia, virtual reality), lectures and conferences. ​The top floor of the upscale 107 Leoforos Syggrou building is home to Hytra, the Onassis Cultural Center top-rated excellent restaurant, which extends out onto the rooftop terrace during the summer months and offers breathtaking views of the Acropolis, the Philopappos monument, Lycabettus Hill and the Saronic gulf. Grand Hyatt Athens, opened in August 2018. It features a rooftop with a seasonal pool and bar with stunning views over the Acropolis. A/C accommodations include elegant furnishings and modern technologies. Includes a fitness center, accessible 24/7, and a restaurant. Fitted with contemporary art pieces, each room and suite at Grand Hyatt Athens, features a 55" flat-screen TV, work desk, and mini-bar. Each offers a marble bathroom along with free toiletries, bathrobes and hairdryer. A safe is also included. Guests may taste Mediterranean and Asian cuisine at the on-site restaurants and sip cocktails at the stylish pool bar or lobby bar. Grand Hyatt Athens, also features a business center and meeting rooms with state-of-the-art technologies, ideal for private or corporate events. the world-famous Greek shipping tycoons.